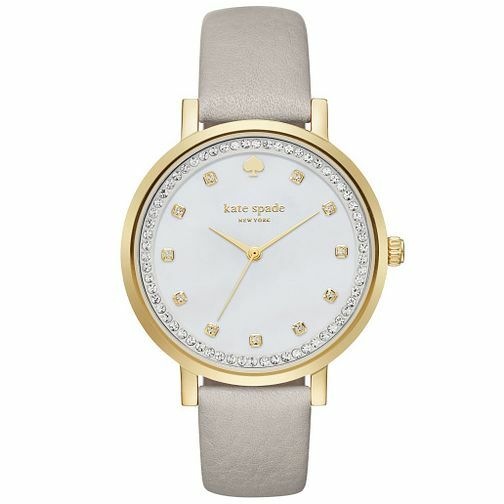 This grey leather strap watch from Kate Spade's Monterey collection features a gold tone case, stone set dial, gold tone hands and Kate Spade branding. A perfect finish to any look. Kate Spade Monterey Gold Tone Stone Set Strap Watch is rated 5.0 out of 5 by 1. Rated 5 out of 5 by Anonymous from Excellent Product - Very Pleased I was very impressed with the efficient service and quality of the product I received. I am very pleased with my purchase and will be definitely buying through Ernest Jones again.